Award Year: 2004 Hispanics are the largest and fastest-growing ethnic group in the U.S. Nearly 60 percent are of Mexican origin, many of them recent immigrants. Despite the size and continued growth of this population, large gaps remain in our understanding of the factors that affect the health and health behaviors of Mexican immigrants. Co-investigators José J. Escarce, M.D., Ph.D. and Leo S. Morales, M.D., Ph.D., M.P.H., examine the health of Mexican immigrants by assessing the relative importance of acculturation and cohort effects. Their project, The Health of Mexican Immigrants in the U.S.: Acculturation or Cohort Effects?, explores the "Hispanic paradox" that is, the phenomenon of immigrants of low socioeconomic status who nevertheless are healthy and exhibit healthy behaviors. The co-investigators also examine apparent health declines among Mexican immigrants who have lived in the U.S. for many years and have become acculturated. Drs. Escarce and Morales analyze health trends in Mexico, the types of individuals who migrate, health differences among immigrants who arrived here over various time periods, and changes in immigration policy to assess future demands on the delivery and financing of U.S. health care. 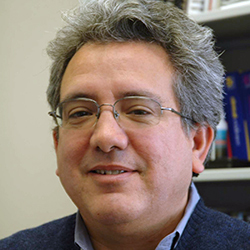 Leo Morales is a Professor of General Internal Medicine, School of Public and an Adjunct Professor in Health Services at the University of Washington Medical School. Dr. Morales was an associate scientific investigator with the Group Health Center for Health Studies. Dr. Morales was associate professor in the division of general internal medicine and health services research at the UCLA School of Medicine and a natural scientist at RAND Corporation. His medical degree is from the University of Washington and his doctorate in philosophy is from the RAND Graduate School in Policy Analysis. His research interests include Latino and immigrant health, patient satisfaction with health services and cross-cultural research methods. Dr. Morales is currently principal investigator of an evaluation of a multiple-site intervention to improve interpreter services for Spanish-speaking Latino patients funded by RWJF. He is the former director of the measurement cores for two health disparities centers at UCLA: the UCLA-Drew Project Export Center on Disparities funded by the National Center on Minority Health and Health Disparities and the UCLA Center for Health Improvement for Minority Elders funded by the National Institute on Aging. In addition to his research activities, Dr. Morales is a board-certified general internist at the UCLA Medical Center where he sees patients and teaches clinical medicine.